Two of Cincinnati’s longest running and scariest haunted houses have teamed up to offer a fright-filled experience found nowhere else. Tour BB Riverboats’ seasonal haunted attraction, The USS Nightmare, and Cincinnati's Dent Schoolhouse back-to-back in the same night and follow it up with a late night Boos cruise aboard BB Riverboats. Guests will board buses in Newport, KY where you will head to both haunted houses for an evening of chills and thrills. 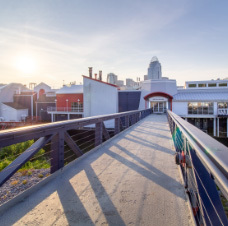 You will then head back to Newport, KY’s Oktoberfest celebration for some seasonal fun before boarding your late night cruise. Trust us, if you’re a Halloween junkie you do not want to miss this!